Stephen Sondheim’s influence occasionally pops up in the most surprising of places. Having already made an impression on punk music (e.g. the album Punk Side Story), Ben Affleck (who performs “God, That’s Good” in the film Jersey Girl), and My Little Pony (which features numbers that resemble Sondheim’s work), a Sondheim-infused young adult novel is hardly surprising, but in the form of The Reece Malcolm List by Amy Spaulding, it’s unquestionably delightful. Readers of The Sondheim Review are likely to recognize the book’s heroine and narrator: a teen more familiar with the ins and outs of high school show choir than athletics, with an iPod full of original cast albums and more Playbills than friends. Devan Mitchell has always been a bit of an outsider, with only one close friend and a strained relationship with her dad and step-mother. Having stumbled onto her mother’s identity when reading the dedication of author Reece Malcolm‘s first New York Times bestseller – clearly aimed at her – Devan begins the titular list to uncover whatever she can about her famous (and famously “un-Googleable”) mother. When Devan’s father dies in a car accident and she’s shipped off to Burbank, CA to live with the mother she’s never met, the quest to know more about the mysterious Reece Malcolm intensifies. As she settles into her new life, Devan has two secret weapons – total comfort starting at a new school, thanks to years of moving around with her family, and a killer belt. Landing in a prestigious performing arts school in Los Angeles, that belt comes in particularly handy. After wowing the choir teacher with her audition performance of “Now You Know” from Merrily We Roll Along, Devan finds herself ensconced in the most competitive singing groups, surrounded by a new group of friends just as eager to obsess about musicals. Of course, Devan falls for one of her fellow theater nerds — you know, the one who’s built like a model and reads like a librarian and sings like Raul Esparza, that we’ve all met in the high school of our fantasies. Naturally, the situation that gets more complicated when they are cast as Mary and Charley in their high school’s production of Merrily. And the snooping through her mom’s home office (and emails) only introduces more questions about her relationship with the mother she is only beginning to get to know. The joys of this book manifest on many levels. A teen novel with references to Annie, Les Mis, Phantom, and Little Shop in the first chapter might raise an eyebrow: can it possibly portray a theater kid in a way that feels authentic and not condescending? But Spaulding is clearly a fan herself, and she uses her knowledge to draw sharp portraits of her characters. To cite just one example, when you read an email exchange between Devan and Justine, her friend from back home, their respective email address, its_our_time@email.com and defying_gravity@email.com, are your first hint that their friendship may not be built to last. The choice of Merrily We Roll Along as the school musical, which becomes the focus of much of the story, also serves more than just establishing the author’s theater credentials. While the book will make perfect sense to readers unfamiliar with the show, the musical’s themes of ambition, dreams, tough choices, and the thorny intersection of friendship and love underscore the challenges the novel’s characters face as well. The connection is subtle but significant. Great theater references add texture to the book, but the novel really soars thanks to a group of enjoyable characters in a number of interesting situations. The book is refreshingly female-centric without relying on cliched teenage girl tropes. There are moments when fashion and boy trouble take center stage, but they never take precedence over the mother/daughter relationship at the core of the story. And perhaps most importantly, Devan is a kid who is getting used to having friends for the first time, but she never lets her outsider status get the best of her. The way she finds strength in her talents and hobbies without ever feeling “less than” despite being on the margins makes her a welcome addition to the canon of teen heroines. 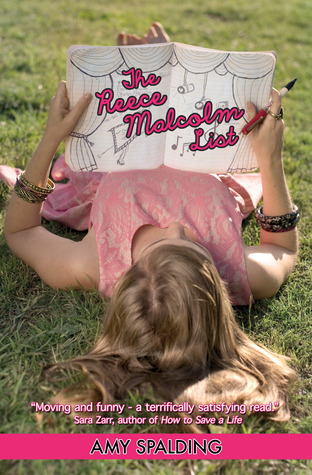 The Reece Malcolm List is a novel with a lot of heart, and teens and adults alike will devour it and hope for more.